Our MYOB accounting practice sets teach students the practical skills essential to accounting using the MYOB accounting software package. This requires students to complete a one-month accounting cycle for a fictional business with all posting, journalising and financial reporting completed using the actual MYOB accounting software. Learning centre with video tutorials: We help students master their understanding of MYOB software by providing a FREE and comprehensive online learning centre with step-by-step instructional videos. Realtime feedback for students: Our online VirtualTutor practice sets provide ongoing feedback to students and assist them to get back-on-track by helping to locate and correct errors. Students tell us that this is like having a personal tutor available 24/7 to help them whenever they need it. Automatic grading for instructors: Our online VirtualTutor practice sets are graded automatically, saving instructors from having to spend the time of doing this themselves. However, if instructors prefer to grade each practice set personally, they can still adopt a practice set that gives them this option. Preventing students from cheating: Our exclusive AntiCheat functionality distributes unique transactions, contexts and numeric values to each individual student to ensure students cannot copy each others' work. No other computerised practice set is able to offer instructors and their students the same features we do. If you are an instructor, please contact us now to find out more or to order a review copy and receive access to an interactive demonstration. If your accounting course teaches students how to use a different accounting software package, or focuses on how to complete the accounting cycle manually, please check our catalogue for more information on the other practice set editions we have available. Copyright © Perdisco 2009: The copyrights in this website are owned by Perdisco. MYOB is the registered trademark of MYOB Technology Pty Ltd. Screen captures from MYOB Accounting Plus v18 are reproduced with permission. 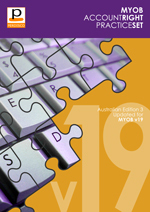 Copyright © 2008 MYOB Technology Pty Ltd. Perdisco is an authorised Publishing Partner of MYOB Technology Pty Limited but this web site and the MYOB Learning Centre Australian Edition 3 are not otherwise affiliated with MYOB Technology Pty Ltd Limited.